Club Penguin Cheats by Mimo777 Club Penguin Cheats by Mimo777: Waves, Waves, Waves on Club Penguin! A storm is a coming to Club Penguin! If you go to the Cove and look thru the binoculars you can see the waves! Will the waves finally tip the Iceberg?! Will there be a tidal wave?! Will we all be standing on top of the ski hill because the island is flooded?! Will Rockhopper get sea sick and ...? Oh wait! I think those waves have always been there. hey mimo i am sure u have noticed that the volcanos smoke is going in a certain direction :-) isnt it cool? club penguin is getting more exciting again!!! :O wow!!!! thats awesome mimo!!! I think the iceberg will finally be tiped. maybe club penguin will be underwater this halloween and u will get a free headgear that helps you breath underwater etc . I think first fire in the dojo, now water! That's an idea. Hmmm. Might Be the wind. Your cheats and hints are awesome Mimo! I haven't really paid attention to the waves if they were there before. well if the waves have not been there all this time then mabey its from the cange of wind that sensei was talking about!!!!! why did u blog if the waves were all ready there? Nice clue and Nice Cheat! 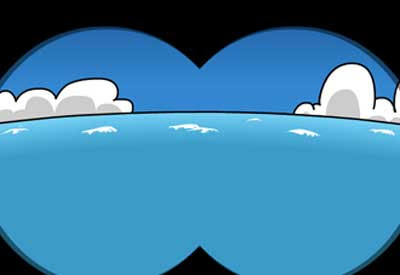 maybe club penguin will be underwater this halloween and u will get a free headgear that helps you breath underwater etc. lol ur so random mimo! and why havent u been posting any of my comments?? P.S. Why isn't one of the labels waves? This has to be a party eluc! I don't see those waves. Actually, forget what I said. There were waves, but never that many! and in the telescope on the beacon there are million s in the distance too! I dont think those have been ther. But still, its cool! I went & looked. What is it? Its quites scary with the volcano erupting aswell i sense a big storm coming this halloween! Wind hasn't been so fast before. nice idea! that would be so awesome! i like halloween because of the stores and all the other awesome stuff! maybe you should submit the avalanche or torando idea to CP! they probably wont do it this year because it might be too late, but there would be a possibility for them to do it next year! and maybe the volcano will erupt. we'll see one halloween! But we got a snorkaling set a couple years ago already. Mimo, they've always been there. Sori dude! But we got a snorkaling set a couple years agos already. Maybe we could snorkel with the snorkeling sets this year! Good idea! But think about it, Why would Mimo post this if the waves have always been there? I'm pretty sure it's a party eluc. Z, i think this was supposed to be a joke. Lol! No, the waves have been here! Yeah...those waves have always been there. The waves have always been there, but there are a lot more now. Check out the binoculars as well, there a millions of waves in the distance! WOOT WOOT i know wat this wave thing is about! The waves have always been there. Mimo, you know what i just noticed? Wind makes waves, but the waves ar going a different direction than te smoke. Weird. Oh yeah and im 1000 days old today on CP!!! I think this is the room clue! Speaking of title wave, here in New zealand we had a tsunami warning! It was caused by a 8.3 earthquake that hit under sea near american samoa,and the tsunami travelled 3000 miles to get to new zealand! Pretty big,eh? Wait.... Weren't those waves already there! I talk to Mimo on twitter. Check out his amazing speeches and he talks to Tooly228 a lot. Goof job Mimo, you are the best Cheat Penguin ever (I'm a rookie Cheat Penguin). this might be a future penguin colour! YAY! I think that Mimo is so fast. Ha ha!! !Very funny once again Mimo!! Mimmo, Your Website Is Awsome!!! Sorry Mimo! Had a soccer game! Awesome Mimo! You have a good eye! The wind could be for the halloween party, just like last year. The sky got dark and the night looked spooky! Remember that one mission? The earthquake one? The volcano could be another mission, which is still very awesome!! Mimo do you sleep or go to school? Because I look at the times and your always on top of things! i think me and safa153 are the only ones who understand the point of this post!! :P haha. Sorrez, but most people know that, its not much of a secret, sorrez. There probably is one coming for Hall-09. Ya, Mimo is pretty random. Mimo might not be posting your comments because you have typed in too many exclamation points, you have typed in word that aren't allowed, or something Mimo does not want to put out in public. Stuff like that is not usually what Mimo posts. Wow! I hope your home town will be ok if it does any damage- of course I wouldn't know anything about tsunami's because here in Texas we don't get very many water stufz. Hey mimo, the other day I saw someone with 3-d glasses on cp. Was that a party item or will it come back in a catalog? i think its bad...from all your comments i figured out. I know this isnt on topic but a few months ( or years) ago, someone asked Mimo his age! Mimo responded "I have to keep this site club penguin." If he does, how come he has Planet Kazmo and such? thats is cool and weird whats the storm for????? Fire, Collecting fire items for Ninja hideout. If it is a flood it will make the ninja amulet! Um ok... :)PS On mission 1, if you click on the nearest red circle at the ice rink, a penguin saws through the ice and says "Peek a Boo!" Cool Post. Isn't it odd that there are waves in the sea? lol. It looks like the volcanoe is gonna erupt soon. MIMO!!!!!! Oh course those waves has been there! hmm.. Mimo now you stumped me! thru = thursday. That's all i can decode. im pretty sure it's wrong though. Help!! Mimo, I got 2 clues correct (I think) and I'm not going to miss this party! Is this a hint of a hint? or do tidal waves predict time? MAYBE THERE WILL BE A STORM FOR HALLOWEEN MIMO!!! SO IT WILL LOOK ALL SPOOKY AND WIERD!! If there IS a storm, it will come at Halloween for the party and it will be all dark! WooOOooOOooh! Lol if your not sure what I just said, it was supposed to be a ghostly wail. Mwa ha ha ha ha!! Well, there has not been that many waves before and i think it got something to do with the storm or a party hint... sometimes u cant see the waves..
Maybe over time they will get stronger...and maybe we will have a flood and get another water party?? :) Thx for reading my comment on the waves! WAIT IT IS A PARTY CLUE ISNT IT? eather the cove, the iceberg, or the ski hill as mentioned in the poem!! If there was a storm coming then mimo would probably cover us as the days go on! The Waves Might Be The Same. But Nothing Explains The Sudden Wind Change A Storm Is Coming ! But Nothing Explains The Sudden Wind Change A Storm Is Coming! remember the "Night of the Living sled" (in club penguin) from last year? it was hilarious! the words that have to do with time. 1. Water Parties are most likely to happen in the summer. 3.We Just has an air party. Maybe the Island will get bigger, you know, when lava mixes with water it turns into rocks. Maybe we'll have a expanding party, LOL! I hope the volcano erupts and all the secret agents have a mission to do again!! *cough*clue*cough* ooooh sorry about that. awesome. I wonder if the waves make rockhopper fly out of his ship and land on the tallest mountain where everyvone can see him while he was doing... buisness. because we dont pay much attention to the binoculars and it might just be different! Mimo777:oh wait I think they were always there! Me:Ya think?!! Mimo can Club Penguin finally do something that has to do with the Iceburg? I think a lot of things about this. First is there might be a flood and we will have to hide in the ninja hide out and get floaties such as the duck and water wings. My second idea would be theres a huge storms that breaks the lighting to light club penguin. We are all in the dark and we get laterns to light the way and tr to turn the power on again. My third idea is that the waves would break the iceberg and we would have to dive in and we would get some sort of floaties or the wings in the catolg would help us fly to safty. And my last idea is nothing would happen because the waves could just be from a boat or some crazy penguin. I am trying to become a cpg mod!!! you made me laugh Mimo! I dont know if anybody noticed butthe waves are comeing from the west. So the storm will probably becoming from the west as well when it starts to come though. ZxZ said- im pretty sure the waves have always been there so why would you post this if you think they have always been there. Well ZxZ there has been waves just they were not as rapid as these ones. There would be like two then 10 seconds later 2 to 3 more. No, it's not. Mimo always labels his eulcs. Hope this helped. Hey Mimo Do You Know How To Make Un baned Forever? Piz Help! I would want a hurricane because thats the coolest storm ever but maybe our igloo's would be gone and some buildings LOL! srry, got excited with my all caps. im srry mimo and other mod ppls! I think Club Penguin will be flooded, then we will have an unexpected PARTY!!! Yea! There is sokme smoke from the volcano going in a certain direction! mimo duh there are always waves in the binoculars!! I am modding becuase i am andswering someones question whos out there. But your right sometime i just forget things but i dont know if its one of those times.